You think you’re indispensable. No one can fill your shoes, or hold down the fort in your absence. Even with all the available technologies that can keep you in touch with the office – and them with you – your physical presence is essential to keep disaster and mayhem from occurring. Fresh ideas and perspective are immaterial to your ongoing success. Who needs a refresher period to spark creativity when you can bask in the comfort of same-old, stale thinking? Others might slack off in your absence. You wouldn’t want to be a role model for anything other than a strong work ethic. You have no personal life. Workaholism is a strategy for filling a void or avoiding challenges or dysfunctions in the rest of your life. I could go on, but I think you get my tongue-in-cheek point. Just as athletes need to alternate performance with rest periods for optimum results, smart professionals realize that vacations are critical to maintaining their competitive and creative edge at work. The alternative is a loser’s game, maybe not in the short-term, but definitely in the long run: burnout, subpar decision quality, and decreased innovation and motivation. Don’t delude yourself into thinking otherwise. If this is your day-to-day reality, consider it a red flag that you are spread too thin and your situation is unsustainable. Corrective action is needed. Often this involves structural changes in roles and responsibilities, delegating to others, or adding personnel. 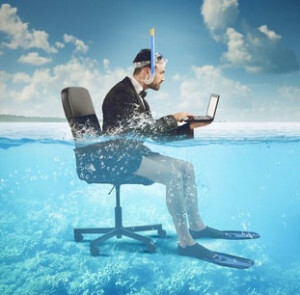 If you have a history of not taking vacations, canceling planned vacations or scaling back vacation time after the fact, consider these as warning signs that something is amiss with your attitude and/or actual work responsibilities or performance. A compulsive workaholic organizational culture can also be at fault. If you are a leader or senior decision maker, it’s important that you set the tone for vacation time by your own example. Individual, team and organizational productivity will benefit over the long-term and promote sustainable success. Next:What Makes a High Definition Leader?